Looking like tasty red rubies, these yummy currants are delicious. I found this recipe at the Hurst berry website. It was easy to adapt to be vegan, and I added a few extra spices as well. We really enjoyed these. Stir in chopped walnuts and set aside. Combine egg replacements, soy milk, and cooking oil. Add this to dry ingredients, stir. Gently, add 1 cup of currants to the batter and mix, stir carefully so as to not break the currants. 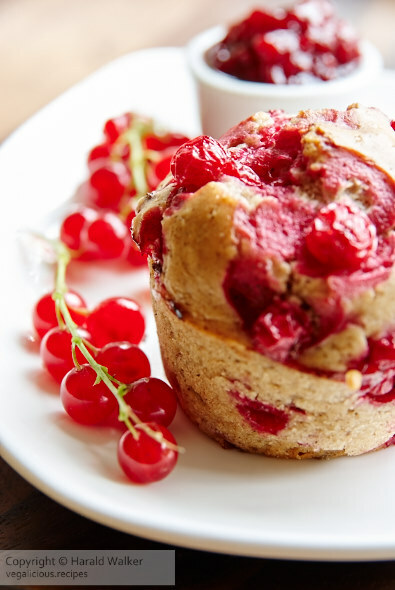 Spoon into muffin cups, scatter the rest of the fresh currants over top. Bake in 375 degree F (190 C) oven for 25 minutes, or until golden. Don’t put too many extra currants in the batter or else the muffins will fall apart, they need enough batter to hold together – the 1 1/4 cups is fine. The recipe works well in half also, it will make 6 very large muffins or 8 medium sized. 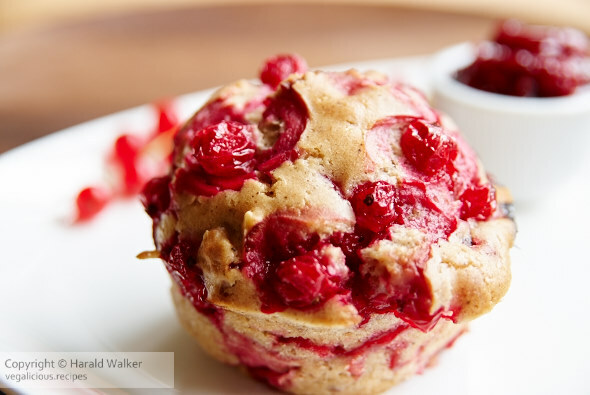 Posted by Chris Walker on July 9, 2008 in Breads and Muffins, Redcurrant, Walnut.